Paul Ehrlich will probably be remembered as being the professor who has been more wrong, more often than any other. To be proved spectacularly wrong , time after time, is apparently a prime qualification for “mad professors” to remain employed. Paul Ehrlich is the perfect example of what is wrong with the tenure system. Of course it helps if your predictions are about catastrophes to come which inevitably garner headlines – no matter how stupid the predictions are. He is at it again making doomsday predictions. This time the doom approaching is because humans have already started the 6th mass extinction which may include the disappearance of the human species. (Actually the earth has too many species and a drastic cull of species is needed). 1969, He predicted that by the end of the century the population of the US would be under 20 million, and our life expectancy would be around 40 years – due not to starvation, but to pesticides. For 4 decades he has made predictions about catastrophes due to famine, depletion of resources, disease, poisoning by pesticides, global warming and climate disruption. Every one of his predictions about the future has been, or is being, proved wrong. Sometimes he gets his history right, but his ability to look forward, even over short times, is hopelessly flawed. Now he is at it again about the 6th mass extinction that has “already started”. But we actually have more species today than we have probably ever had. The detritus of failed and failing species needs to be cleaned out. Abstract: ... We assess, using extremely conservative assumptions, whether human activities are causing a mass extinction. First, we use a recent estimate of a background rate of 2 mammal extinctions per 10,000 species per 100 years (that is, 2 E/MSY), which is twice as high as widely used previous estimates. We then compare this rate with the current rate of mammal and vertebrate extinctions. The latter is conservatively low because listing a species as extinct requires meeting stringent criteria. Even under our assumptions, which would tend to minimize evidence of an incipient mass extinction, the average rate of vertebrate species loss over the last century is up to 114 times higher than the background rate. Under the 2 E/MSY background rate, the number of species that have gone extinct in the last century would have taken, depending on the vertebrate taxon, between 800 and 10,000 years to disappear. These estimates reveal an exceptionally rapid loss of biodiversity over the last few centuries, indicating that a sixth mass extinction is already under way. But there are still more species around than ever before. And a lot of them need to go extinct to make way for others that are more suited. No previous mass extinction has been any threat to life on earth though it has each time cleared the decks of species not fit or worthy to continue. The fossil record shows that biodiversity in the world has been increasing dramatically for 200 million years and is likely to continue. 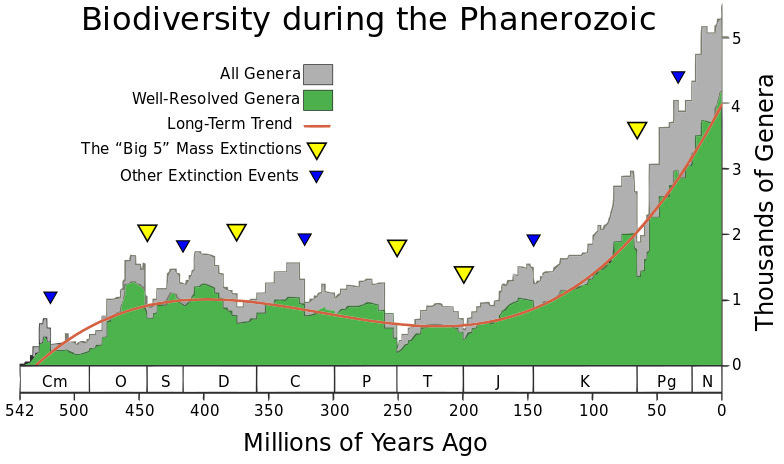 The two mass extinctions in that period (at 201 million and 66 million years ago) slowed the trend only temporarily. Genera are the next taxonomic level up from species and are easier to detect in fossils. The Phanerozoic is the 540-million-year period in which animal life has proliferated. Chart created by and courtesy of University of Chicago paleontologists J. John Sepkoski, Jr. and David M. Raup. But the one good thing about Paul Ehrlich’s predictions is that it provides a clear identification of an area not to worry too much about. I have a theory that within a hundred years we will be bemoaning the lack of world population. The collapse of society will be forecast as an impending catastrophe as the total world population stabilises at less than 10 billion with the proportion of the young working population decreasing relative to the increasing numbers of the “leisured” population. And that apocalypse too shall not come to pass.